Every religion has at its heart a heroic narrative. Some super-manly warrior god, or beautiful yet deadly sword-wielding goddess, or brave human champion who overcomes great adversity and completes a heroic quest to save his people, or a woman, or a friend. Every religion worth its salt is built on a hero narrative. The salvation of an individual, or the world, or the universe itself stands on the firm foundation of a god or person’s heroic work. All this has been distilled the past hundred years or so into comic book heroes. Superman is one of the most recognizable and popular of heroes. Superman was created by Jerry Siegel and Joel Shuster who, being Jewish, drew from biblical heroes like Samson, who was the strongest man in the Bible, and Moses, who helped free God’s people from slavery. For them, these familiar stories they’d grown up hearing sounded like the best way to layout the story of a great hero. But the motivation for their story came from a deeper, more painful place. Jerry Siegel’s father had been fatally shot by a robber. At the same time this happened, in the 1930s, America was suffering through the Great Depression and the world was just being woken up to what was happening in Germany under the rule of Adolf Hitler. As one writer remarked: “They were looking for a savior figure they could relate to, they could envision, something to give them hope, inspire them.” Superman was the savior Siegel and Shuster believed the world needed, to save fathers from being shot to death, to save people from crushing hunger and illness, and to rescue the innocent from the schemes of evil men, just like (they believed) Samson and Moses did for Israel. Siegel and Shuster tapped into a fear all people experience at one time or another. We’re not in control of what happens to us. We’re vulnerable. And at any moment, forces beyond our power and comprehension can take away our job, our well-being, and our life. And who will save us? We need a hero, obviously. A “super man” kind of savior. An other-worldly force for good. We need a heroic figure, one who comes from above. A man whose heavenly father sends his only son to save the Earth. Then, when he comes down to Earth, is raised by two human parents, Martha and Jonathan (who originally had the names Mary and Joseph). And at age thirty, he leaves home to engage in his public mission. This super-warrior, this savior of the world will, in his ministry, fight for the biblical principles of truth and justice. Maybe he dies at the hands of an indescribable chaotic force of evil. And maybe he’s not dead, but recharging his batteries, and “rises from death” to overcome the evil that tried to destroy him. You know, a super-manly warrior-god like Kal-El—Superman. But, the truth is that as much as we want a hero like Superman to rescue us from evil and death, that’s not what God gives us. Sure, there are similarities between the Superman narrative and what the Gospels record about Jesus. Siegel and Shuster were Jewish after all, and Jesus is the subject of “all the law and the prophets.” But, where Kal-El and Jesus part ways is in the Gospels. Jesus isn’t Superman. He’s not from another planet. He’s from Earth. He doesn’t possess powers far beyond those of mortal men. No. Instead, he’s just as ordinary as anybody else. Most important, he’s born, lives, and dies a Clark Kent kind of guy. And when he comes out of the tomb he’s still Clark Kent. No red cape and blue tights. No heat vision or cold breath. No alter-ego. He’s not “faster than a speeding bullet, more powerful than a locomotive, able to leap tall buildings in a single bound.” From beginning to end Jesus is just plain-old Clark Kent. At the root of Christian faith then is the truth about God and us. We want to be more than human. We want to be little gods and live that unachievable reality vicariously through Christ-figures; heroes whom we can never be. God, on the other hand, wants to become human to restore our lost humanity. Christmas signals to us that the purpose of life is not to become Supermen, but to be satisfied being Clark Kent. Men and women born into ordinary families, who live more or less the same life as anyone else, and who die like everyone else. Superman is exactly who Jesus is not. Instead, as Luther said, “I worship no other God than this incarnate and human God, Jesus Christ.” Jesus, the very human child who “grew in wisdom and stature, who enjoyed the favor of God and men.” The man from Nazareth, Joseph’s son, Who gathered students to Himself and taught them the way of God’s kingdom before His brutal torture at the hands of Roman soldiers. And, of course, His all-too-human bloody suffering and deathly execution on a cross. 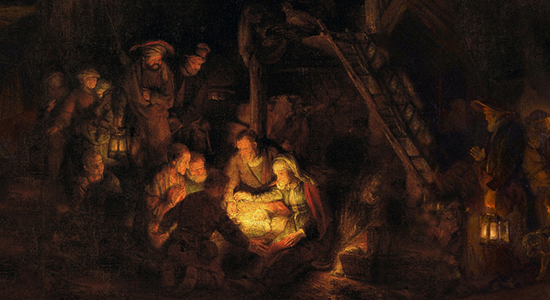 This Christmas, come and receive the Christ-child, the Savior of the nations. Go and see, Clark Kent in the manger.